Editor's note: the Official Thursday Weigh-In is taking a short hiatus, while Melissa panics because she's gained another pound this week and just about burst into tears right in front of the weigh-in lady at the scales. Thank you for your patience. So, instead of talking about how well my weight loss journey is NOT going, let's talk about how well Anna Marie did NOT do at the reading fair yesterday, shall we? She was pretty upset when I called her yesterday afternoon. She complained about the whitespace on her board (although that's not what she called it, that's what it was) compared to the other kids. I tried explaining to her that I worked in designing things for a living, and that whitespace was important - otherwise, the important message you were trying to convey would get lost in the visual clutter. Her response? "I don't get it." Of course you don't dear girl. You are seven years old. For you, more is more. Last night was parents night, when we got to see our kids' projects all set up - code for "check out the competition and see what you can do next year." 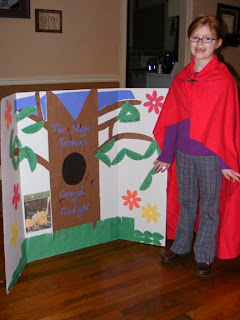 In reality, Anna Marie's project was at least as good as the best ones out there. Yes, I'm probably a bit biased, but I didn't see a single entry that was as creatively done as hers. One of the judges asked who had done her board, and she said that she and I had. Truthfully, she should have said that it was her and my Cricut, because that diecutting machine saved my everloving sanity this week. It really did most of the work! But today is a fresh start, for both my weight and Anna Marie's dreams of reading fair glory. I got up extra early today to exercise, because if I don't, I won't make it a priority. And Anna Marie has a whole other year to plan for the next reading fair. Her only requirement: one of the characters must allow her to wear that red cape again. I just realized this morning that it's been ages since I last blogged. Well, maybe not ages, but several days, to be sure. What have I been up to? Mostly the reading fair. This is our first big school project, and I wish I could say it would be our last - trying to do something like this with my strong-willed daughter is not easy! It's hard to strike a balance between telling her that her ideas won't work (i.e., painting an entire tri-fold project board with a small watercolor brush) and letting this be her project. If I didn't have my Cricut, I'd probably be institutionalized by now. That thing has been a life saver! I also experienced another first this week: my first hockey game! And I was on the clock! It wasn't NHL or anything - more like the Central Hockey League - but it was a hockey game, all the same. The team is based in the county just north of here, and they sponsored a morning game field trip event. No fewer than 8,400 screaming kids, each with his or her own folded paper noisemaker - it was mass chaos and confusion! I was told that two groups from our county would be there, but I couldn't find them. I was doing well to find my place, after wandering around the civic center forever, and traipsing up to the team's office, and finally breaking down and calling my office mate to ask her to find the invitation email giving me instructions and read it to me. Yes, I had instructions. No, I didn't take them with me. Yes, I'm a well-prepared reporter! I finally found what I think was the right spot - no one was really sure - in the team's corporate suite. It wasn't half as nice as it sounds. The game was three hours long, and all they had for food was a bowl of fruit, a platter of donuts (which I stayed far away from, naturally), a bowl of fruit juice bottles, and an airpot of mediocre coffee. Where was the catered buffet I'd heard that private suites had? I expected much more. Hmph. But cold - Lord almighty, it was cold! Even that far from the ice, my feet were starting to get numb by the time the third period started. And you hockey fans out there, I'm wondering, are all those fights staged? Because about 10 minutes into the first period, I looked down to see some guy on the ice, his face mask thrown asunder, and another player on top of him beating the tar out of him. Once the kids got a whiff of that action, every time two players looked at each other cross-eyed they were trying to egg on a fight. It was like the school cafeteria, only without a principal to break it up. Now, we're in the midst of a snow day, only without any snow! There was some sleet here in town (and light snowfall in the county) but the roads seem pretty clear. They actually seemed pretty clear at 6:30 a.m. when the decision was made to close, but again, whatever. Anna Marie came to work with me for a few hours, and then Aunt Manda came to our house for lunch and is staying with her. I guess not all the roads are clear though, or at least closer to the church, because I just got a text message that service was canceled. At least we'll have more time to finish up the *coughreadingfairprojectcough* which is due in the morning. Try to stay warm, y'all, and send some good reading fair vibes my way. I sure need it! Good morning! I really should make posting this more of a priority, but gosh almighty, it's very hard. • The WW meeting gets out around 7 p.m., sometimes a little later. • I get home a few minutes later, and eat dinner. • While eating dinner, I have to also get Anna Marie ready for bed. • I put her to bed. • I get her lunch money/test folder ready for the next day, and load the coffee maker. • There may be some laundry or other housework involved, too. • I eventually collapse in a heap on my bed, and watch TV until I can't hold my eyes open and Jason takes the cue to turn it off. Anyway - I gained a pound this week, which brings me up to, what, 148.5, which is dangerously close to 150, which is within a hair's breadth of 200! I don't really have time to ponder the specifics of what all that means right now, so I'll leave the deep thinking up to you guys. Oh my word, people. I'm going to to have to get a thermometer to hang around my neck, so I can justify to folks when I say I'm FREEZING. Some people need hard, empirical data, you know. They just won't take my word for it that it's blue cold, even indoors. ESPECIALLY indoors. I'm pretty sick of winter already, y'all. And really sick of having to sit indoors bundled up in my wool coat. Especially at restaurants. And at work. And at church. And you know how people will say, "If it's this cold, we should at least get some snow!" This morning, we did actually get a few flurries. Emphasis on flurries. I think about five flakes hit my windshield as I was dropping Anna Marie off at school, but it had basically ceased by the time I got to work. About that ball I attended on Saturday - I ended up wearing a pair of capri-length dress pants with my tall boots, thus rendering me slightly pirate-like in my demeanor. I couldn't get Jason or Amanda to go with me, so I ended up taking my mom. Which was fine, really. She had never experienced anything remotely like that - lots of music, lots of ladies who obviously didn't check the mirror before they left the house (why else would they have let themselves hang out of their dresses that way? ), and lots and LOTS of liquor. The better to lubricate the live auction later, naturally. The food was only so-so. The prime rib had apparently been held too long, and was no longer rare - rendering it no longer prime rib, but roast beef. Dessert was king cake, and honestly, I wasn't impressed. Amanda had eaten some at a press convention several years ago, and was blown away - the kind of blown away you get where you can't stop thinking about a food. I'm thinking that, unlike Amanda's king cake, mine just came from the Kroger up the street. We ended up leaving about two hours into the evening. Mom wanted to bid on a couple of purses on the silent auction table, but that wasn't over until 10 p.m. and we didn't intend on being there that long. I was glad that I got to take mom. She never gets to go to fancy events like that, and she got a free meal out of the deal - always a plus in her book! And we really don't get to do enough things together, just the two of us. And when we do, her cell phone is usually ringing constantly, interrupting us. Somehow, it was silent on Saturday night. I don't know what my relationship with her is supposed to be like as an adult. As a child, there were so many of us children, and I was the oldest, so I was expected to be responsible for myself - and often several others too. Do we, as women, ever find a balance in our adult relationships with our mothers, and come to terms with our raising and how it has affected us? And I hope that Anna Marie and I are successful in navigating those waters as time marches on. I bet y'all thought I made good on my promise to leave Weight Watchers, didn't you? Nope. Not yet. Maybe in February. I didn't want to get out Thursday night, because it was all of 20 degrees outside and I would have rather just opened up a can of soup and lounged in my jammies. But I didn't - I bundled up, and weighed in. And I did it all for you! Ok, so maybe a little for me, too. At any rate, I lost a half pound this week, down to 147.5. I've tried to be extra special good yesterday, and will be today, because I'm going to that Crystal Ball thing again tonight like I did last year. Now, if I could just wrangle a new dress out of the deal, I'd be A-OK! I have been mulling over many things lately, and - don't fall out from shock - but my continuing with Weight Watchers is one of them. Don't get me wrong - the tools I've gained there over the past three and a half years have been invaluable to getting my eating, and the eating of my family, going in a better direction. And I love me some WW ladies. I enjoy celebrating when they lose, or comforting when they gain. I am beginning, however, to not love tying up every Thursday night of my life, as I've done since August 2005. Especially when Anna Marie begs me to "weigh in and leave" so I can come back home to her, or I have to rearrange my other plans to make it. For instance, I missed three weigh-ins in a row in December, two of which were on the holidays, and one of which was because Anna Marie had to be at school at 5:45 for a program. This week, I had to weigh in and go back to work. The first week of February, I probably won't weigh in at all because that's the night of the Winter Jam concert, and I have a date with TobyMac. And its time for confession, which I was told this morning (by a text message from one of my friends at church, who has a text message scripture ministry) was something that I needed to do. I'm not journaling, and by "not journaling" I mean "not even really keeping up with my healthy guidelines, or my non-CORE foods." And, I haven't been exercising as regularly as I should. Yes, Jason bought me that wonderful Gazelle a couple of years ago for Christmas, and yes, it sits in my living room, ready for me to watch TV while I use it. But guess what invariably happens every time I step on? Yes, while I wanted exercise equipment at home so that I could not spend so much time away from my family, guess what - the family is interfering with my ability to exercise. Does it matter that I wait until she's playing on the computer, or in the tub? Nope. It's apparently some unwritten law of nature - the moment I step on (and put in my earphones or turn on the tube) she's going to need my assistance with something. How am I supposed to get my heart rate up when I keep having to stop? And no, Jason can't assist her. Invariably when he tries, she insists that I come to her aid. I do live in a "walkable" neighborhood, and when the weather clears up, I can take Anna Marie out on her bike, but that also includes lots of stops and starts. The sidewalks are not conducive to bike riding, and she's still on training wheels, so it's hard for her to get any speed. With the 24-hour club, I could get up and go before Anna Marie got up, while Jason was still at home - well, on the days when he doesn't get up at 2 a.m. to go to the auction. No, I don't get up that early now, but I think the draw of a bright, well-lit club might help with that. It would also give me some variety, like weights and a treadmill, instead of just the Gazelle. On the days when I couldn't go because he had already left the house, I could get up early anyway and use the Gazelle at home. The club would also offer some of the same "social" benefits as Weight Watchers, since we're in such a small town and I know so many of the people who would be there. I know what you're thinking - "Just do both! It's just $15 a month!" That may not sound like a lot, but in our current economic situation, I don't know if I could justify the extra expense without cutting back somewhere else - and I'm spending $11 a week on Weight Watchers. I'd actually make money on the deal, some of which could maybe go towards saving up for the Wii! I TRULY hate to leave Weight Watchers just a few pounds shy of my goal weight, but I think it might be time to move on. I'm going to talk this over with Jason, and maybe by the first of February I'll have made my decision. Then I won't have to be late for my date with TobyMac, er I mean, Jason, at Winter Jam! I was asked if I'd blogged this story yet, and really, until I was asked that question, I didn't find it was all that blog-able. But apparently this other person (who can spin quite a yarn herself, you see,) thought it was blog-worthy. So here goes. Last Monday, I came home from work and started dinner. That method of cooking, if you don't know, required me to put a bit of canola oil in a pan, and heat that pan, and place some pieces of meat, in this case pork, into that heated oil. You know how sometimes you put something into hot oil, and the oil splatters? Well, that's exactly what happened to me on last Monday night. It splattered all over my clothes - my good, work clothes. So it splatters. And I panic. PANIC! Because I don't have all that many clothes to begin with, and I can't afford to lose a single article! And I grab the Shout from off the laundry cart (which, since our laundry machines are in the kitchen, is in easy reach) and proceed to pre-treat my clothes. My clothes (work clothes, remember) which are still on my person. I then decided that this was not a comfortable development, the wearing of clothes saturated with stain remover. It was cold, and it was sticking to my skin, and the scent was not conducive to eating dinner. So I told myself, "Self, you just need to get into your PJs." Except - it was around this same time that I also realized that the trash needed to be rolled to the curb. And Jason was already in his PJs, so, being the good wife, I rolled the trash can out. While the food was cooking. As I got closer to the house, I heard the unmistakable beeping of a smoke detector. As I entered the house, I realized it was our smoke detector. And in that kitchen, I found my husband, accusing me of trying to burn the house down by leaving the stove unattended and not buying my logic (that I had to go ahead and take out the trash so that I could get out of my Shout-saturated shirt and into my PJs) at ALL. I had to open the back door to help filter the smoke outside, and the smoke detector continued to go off intermittently throughout the meal. Nice. Are you waiting on the ironic part of my story? Guess what Amanda got me for Christmas. A really nice, for-real apron. From Williams-Sonoma even. The wearing of which could have saved me from the whole ordeal. Unlike revenge, it's a dish best served hot. I looked at my calendar today, and it's been since December 11 that I've weighed! Nearly a month! Anyway - I did gain a pound, putting me back up to 148, but know what? I am thrilled. Because I know how I've eaten during the holidays/funerals/general life situations of the past month, and while I cleaned up my act recently, I did spend several days eating anything that had the misfortune of crossing my path. So now, I'm all caught up, and back on track, and ready to go! On Sunday night, I attended a baby shower honoring our youth pastor and his wife. They have been praying for a child for five years, and will welcome their daughter at the end of this month. There was enough pink in that room to sink a battleship, and two friends at my table trying to convince me to have another baby. Yesterday at lunch, I ran in to a man I know in our community, whose wife had suffered a stroke over the weekend. I asked how she was doing, and he said that the end was near and the family was considering taking her off life support. They did so that afternoon, and she passed from one world into the next. Later yesterday afternoon, I interviewed a woman on her 100th birthday. It was excruciatingly hot in her little house, but other than being cold natured and having knee problems, she was in remarkably good health. She had her wits about her, and said she didn't have very many fond childhood memories because she spent so much time working in the fields with her family. Last night I attended a visitation at a local funeral home for a very prominent man. I don't think I ever met him, but I've known his wife for some time. In the 20 or so minutes that we were there, I counted at least three current or former judges, a bank president, and several city and county officials. Anyone who was anyone had come out to honor the life of service this gentleman had given to his community. Maybe it's the start of the new year, or maybe it's all the time I've spent in funeral homes lately, but I've been thinking a lot about life and how it's lived. There is an old adage that says that life is what you do "in the dashes" - in that time period between the dates on your tombstone. As this new year dawns, some are just starting that life, some are seeing that life end, and some are trying to survive life the best they know how. I, for one, am being just a little more mindful today of how I'm living "in the dash." A few weeks ago, our pastor preached a sermon called "What is God hiding?" The gist of it was the same as one of my college professors had said: if God told you ahead of time what you'd be doing (and facing) in the future, you'd run far, far away. Instead, He lets us be prepared, little by little, for what He has for us to do - and the challenges life hands us. Think about all the things that have happened in 2008. If I'd known at the beginning of the year that I'd lose two uncles in December, I'd have spent the whole year dreading that month. If I'd known that Jason was going to take over operations of the cafeteria during the summer, I'd have been freaked out WAY longer than I already was. How would I have handled knowing that my dad was going to suffer a stroke in January, and then all of the fallout from that - physical, emotional, and financial? Who could have known that in February our church would close down, and we'd find ourselves finding a new place to worship? If you'd have told me last New Years Eve that I'd have spent this New Year's Eve playing Wii with my Sunday School class, I would not have believed it. 2008 was the year that I covered my first murder trial, that Anna Marie got baptized and learned to tie her shoe, and that a raccoon took up residence in my attic. Life is unexpected, and as we enter this new year, I can't wait to see what God is hiding - the good and the bad. We can't have the good without the bad, as the saying goes. And I'm glad to know that I'll have all of you out there in Blogland as we watch this year unfold together. Last night our Sunday School class had a party, and someone brought their Wii. And they hooked it into the big projector screen in our Sunday School room (which used to be the sanctuary). And we played Wii for nearly three hours. And now, I want one! I know I'm late on the Wii bandwagon, but this thing was totally different from any video game I'd ever experienced. Not only was it fun to play the games, it was fun to watch the games being played! The nice Wii lady had just gotten the Wii Fit, so we played soccer, and a game where we had to put balls through holes in floors, and a tightrope game, and bowling, and other fun stuff. We even got Jason in on the action - he and our Sunday School teacher played in a bowling tournament with another girl and myself. I don't know when I've had so much fun! So now, I'm developing a plan. I figure if we can save a little bit of money each week, eventually we'll have enough to buy one - say, around this time next year. My mind is made up - I'm getting a Wii!